Over the past year I fell in love with listening to podcasts. While they've just become popular in recent years, I must admit I was a little late to the podcast scene, simply because I didn't really understand what they were. My job that I was previously working required several mindless tasks, so we were allowed to have headphones while we worked. I've never been a huge fan of listening to music anywhere other than the car, so I decided to try listening to podcasts while I worked. For me, they're the most interesting time passer. If you're unfamiliar with podcasts, they are essentially a form of audio that allows you to get a significant amount of information on just about any topic. Think of it basically as listening to a show on the radio... and if that doesn't make sense, then just try listening to one on your next commute! I know it's very common for people to set up a podcast for a long commute or while cleaning the house! For me, I only really listen to them while I work. Find what works for you, and I promise you'll love it. 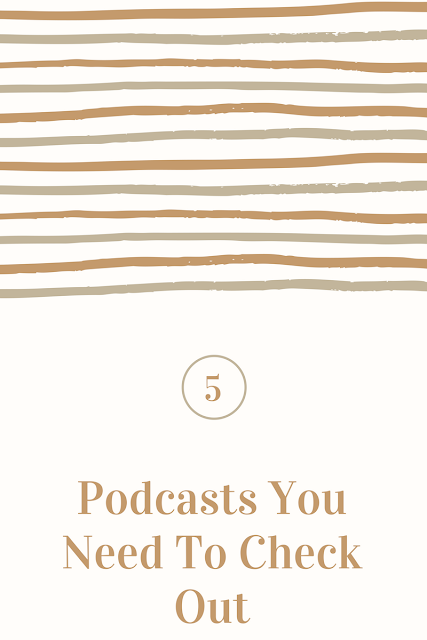 Now that I've told you what podcasts are and when and how to listen, I'm going to share with you my 5 favorites that I can't stop talking about. My favorite genre is true crime podcasts, but I threw in a few others if that's not your thing. I've linked up each podcast as well, so feel free to click the links to get you to the site where you can listen. Now let's get to it! Serial Season One - Probably one of the most well-known podcasts, this week-by-week show covered the story of the conviction of Adnan Syed in the murder of Hae Min Lee. This was one of the most interesting cases I had ever heard and really peaked my interest into true crime. If I could only recommend one podcast to someone, this would be it. But be warned... once you start, you won't want to stop! When you're finished, listen to Undisclosed Season One. This podcast takes a more in depth look into the case, and it's absolutely fascinating! Up and Vanished - Another true crime podcast, Up and Vanished takes a look into the missing persons case of Tara Grinstead. The twists and turns of this podcasts are so thrilling, you have to check it out... no spoilers here! Stuff You Should Know - This podcast covers just about any topic, and is narrated by two men with dry, funny senses of humor. If you're looking for something to talk about at your next dinner party, listen to an episode of this, and you'll be sure to be a wealth of knowledge on any topic! This American Life - This podcast as been around for a long time, and there's definitely a reason why. Each episode typically takes a look at several different stories that somehow relate to the main topic that they've chosen. This is by far the hardest to explain (even they have a hard time), but give it a few listens, and I'm sure you'll be hooked! The Vanished Podcast - The Vanished Podcast has a great mission - bringing attention to missing persons cases that haven't been largely covered by the media. The narrator shares the stories, interviews family members of missing persons, and encourages her listeners to share any knowledge they have into the case. Another interesting true crime podcast you can't miss! So there you have it - my top 5 podcasts I completely binge on! I hope you check some of them out, and let me know what you think in the comments below.